Draft: 2002, Boston Red Sox, 8th rd. Brandon Douglas Moss was originally signed by Boston scout Rob English…married, wife's name is Allison…has two sons, Jayden (10/28/09) and Brody (4/16/13)…is a 2002 graduate of Loganville (GA) High School where he played baseball and football…was a teammate of Jeff Francoeur, Brian McCann and Matt Capps while playing for Team Georgia in the 2001 Sun Belt Classic in Oklahoma. Spent the entire season with Kansas City and hit .207 with 22 home runs and 50 RBI in 118 games…the batting average was his lowest in a full season as was his .279 on-base percentage… made 92 of his 98 starts in games started by a right-handed pitcher…batted .271 (19-for-70) against left-handed pitchers compared to .192 (56-for-292) against right-handers…hit 19 of his 22 home runs off righties…had a .259 batting average with 15 of his 22 home runs and 32 of his 50 RBI in 59 games at home…batted .150 on the road…is a .272 (70-for-257) career hitter at Kauffman Stadium with 18 home runs and 45 RBI in 76 regular season games…hit .195 with runners in scoring position, including .179 with RISP and two outs…is a .195 (78-for-399) career hitter with RISP and two outs…went 2-for-7 (.286) with a grand slam and six RBI with the bases loaded… batted .432 with five home runs when putting the first pitch in play…had a .137 batting average with two strikes…hit all of his home runs as the designated hitter, which was the fifth best total by a DH in the American League…tied for seventh in extra base hits (33) and tied for eighth in RBI (47)…started 89 games at designated hitter, five at first base, three in left field and one in right field…also went 1-for-11 (.091) with a walk, two RBI and five strikeouts as a pinch hitter…started games at every spot in the order from fourth through eighth and saw his most action with 43 starts hitting seventh. KANSAS CITY: Was the Royals Opening Day starter at designated hitter and was 0-for-3 with a strikeout April 3 at Minnesota…went 1-for-23 with 12 strikeouts over his first seven games… the one hit was a home run April 9 at Houston…finished April with a .167 batting average in 17 games…went 0-for-4 with a career-high tying four strikeouts May 10 at Tampa Bay…then went 10-for-31 (.323) with five home runs and seven RBI over his next eight games through May 26… had his first two-homer game of the season May 21 at Minnesota and hit six of his 22 home runs against the Twins…had three hits in that game, his first of three three-hit games (July 1 against Minnesota and July 19 against Detroit)…hit .175 with just one home run and two RBI over a 29- game stretch from May 27 to July 17…then batted .300 (15-for-50) with four home runs and 13 RBI over his next 14 games through Aug. 4…drove in a season-high four runs July 20 against Detroit…had a walk-off double July 23 against Chicago (AL), his ninth career game-ending RBI…had his best month in July when he hit .284 with three home runs and 10 RBI in 20 games…connected for his second two-homer game of the season and the 11th of his career Aug. 3 against Seattle… now has 16 career home runs against the Mariners, which are his most against any team…went 9-for-64 (.141) over a 25-game stretch from Aug. 6 to Sept. 9…then hit safely in a season-high six consecutive games from Sept. 10-15…went 9-for-21 (.429) with four home runs and 10 RBI during the streak…that included a pair of four-RBI games on Sept. 10 against Minnesota and Sept. 12 against Chicago (AL)…hit his fourth career grand slam in the latter contest against the White Sox, accounting for all of the Royals runs in a 4-3 victory…it was his third consecutive game with a home run, which marks the third time in his career he homered in at least three straight games. Spent the entire season with St. Louis, batting .225 with 28 homers and 67 RBI in 128 games…started 40 games at first base, 42 in left field and 19 in right field....His 28 home runs were 14th among left-handed hitters, while it marked his highest total since hitting 30 with Oakland in 2013...Averaged a home run once every 14.75 at bats (28 in 413 AB), ranking him third in the NL among players with at least 400 at bats...Had two multi-homer games, June 8 at Cincinnati and June 25 vs. the Mets, the eighth and ninth of his career...Tied for fifth in the NL with three pinch-hit homers… went 6-for-21 (.286) with three homers and seven RBI as a pinch-hitter...Smacked seven homers over the course of 12 games (Aug. 11-25), ranking second in the Majors during that span, behind only Yankees' rookie Gary Sanchez (8)...Hit the longest home run in Busch Stadium III history with a 477-foot blast off current teammate Chris Young (June 30)...49 of his 93 hits (53 percent) went for extra-bases… his .484 slugging percentage ranked 17th in the NL (minimum 400 at bats)...Placed on the 15-day disabled list (sprained left ankle), July 5…reinstated Aug. 2. Acquired by St. Louis from Cleveland on July 30 in exchange for minor league left-handed pitcher Rob Kaminsky…Played in 145 games over the course of the season with 94 in Cleveland and 51 in St. Louis. Batted a combined .226 with 19 HR and 58 RBI. Of his 19 home runs, 15 were hit on the road…Hit three game-winning RBI with the Cardinals including a walk-off single vs. COL (8/2), his first home run with the Cardinals at ARI (8/27) and a walk-off three-run home run vs. WSH (9/1), his fifth career game-ending home run…Hit the longest home run by a left-handed batter in Busch Stadium III history when he belted a 454 ft., shot of Max Scherzer vs.WSH (9/2) over the right-field bullpen, a day after hitting his walk-off home run…Hit four home runs in each of his first three months while with Cleveland, and had a season-high 14 RBI in both April and May…Posted seven multi-hit games with STL including four straight from 8/31-9/4…Rapped out two doubles at CHI (9/18), his first game with two doubles since 5/18/14 at CLE…Reached base four times at ATL (10/2) with a double, single and two walks; tying his season high at SEA (5/31, 12 inn. )…At time of his trade, led the Indians with 15 home runs and was 2nd with 50 RBI…Hit two home runs and had a career-best seven RBI at DET (4/24)…Hit his 100th career home run at KC (6/2), off Jeremy Guthrie. Brandon is coming off his first career All-Star selection in 2014, hitting .234 (117-500) with 23 doubles, 2 triples, 25 home runs and 81 RBI in a career-high 147 games ... Hit .268 (86-321) with 17 2B, 21 HR and 66 RBI in 89 games during his All-Star first half before injuries slowed him in the second half...He ranked in the top 10 in the American League in home runs (T 5th, 21), RBI (6th, 66), extra-base hits (T 6th, 40) and SLG (8th, .530) at the All-Star Break and was 10th in the A.L. in RBI (76) as late as August 18th ... Appeared in 67 games at first base, 56 games in left field and 34 games in right field for the A's. Was tied with the Reds' Devin Mesoraco for the Major League lead in grand slams (3) … Marked the six th time in Oakland history and 10th time in Athletics history a player hit three or more grand slams in a season and was one short of the record of four set by Jason Giambi in 2000 (entered season with 0 career slams). Hit .197 in Oakland in 2014 comp ared to .265 on the road (72-272, 13 HR, 47 RBI, 77 G ), the lowest home average in the A.L., 3rd lowest in MLB and 3rd lowest in O akland history… Matched his career highs w/4 RS, 2 2B and 3 extra base hits on May 18 at Cleveland and was named A.L. P layer of the W eek for the week of May 12 to 18 (10-for-22; 8RS, 5 2B, 3HR, 11RBI)...Third career weekly honor...Was batting .301 with 10 home runs and 40 RBI over his first 45 games through May 21… Underwent right hip surgery (torn labrum/imp ingement) on October 23 in Nashville, TN (Dr. Thomas Byrd). Led the A's with 30 home runs and finished second with 87 RBI despite spending most of the season in a platoon…made 106 of his 115 starts against right-handed pitching and started just three games against a lefthanded pitcher after May 12…became the 19th player (40th time) in Oakland history to hit 30 home runs…had 505 plate appearances and only Mark McGwire (39 HR in 1995, 34 in 1997) hit as many home runs with as few plate appearances…ranked sixth in the American League in slugging percentage (.522) and tied for eighth in home runs…also ranked fourth in the AL in fewest at bats per home run (14.9) and fifth in fewest at bats per RBI (5.1)…is averaging 13.94 at bats per home run over the last two years, which is the fourth best mark in the majors among batters with 750 or more plate appearances…also ranks fourth in at bats per RBI (5.12)…hit .256 in 145 games …in addition to home runs, he led the A's in slugging and strikeouts (140) and tied for the team-lead in hit by pitches (6)…had career highs in games, at bats (446), runs (73), hits (114), doubles (23), home runs, RBI, walks (50), strikeouts, stolen bases (4), hit by pitches and extra base hits (56)…batted .268 (98-for-366) with 26 of his 30 home runs against right-handed pitching, compared to .200 (16-for-80) against left-handers…has hit 58 of his 66 career home runs off right-handers… slugged .552 against righties in 2013, .388 against lefties…his 26 home runs off right-handers tied for fifth most in the AL…also tied for third in the AL in home runs with two outs (14), ranked fourth in home runs on the road (20), tied for fifth in home runs with runners on base (15), tied for sixth in homers with two strikes (11) and tied for seventh in homers at night (22)…was batting .228 with 16 home runs, 44 RBI and 93 strikeouts in 87 games at the All-Star Break…then hit .296 with 14 home runs, 43 RBI and 47 strikeouts in 58 games after the break…tied for third in the AL in home runs after the All-Star Break (14)…slugged .461 before the break, .615 after the break…grounded into just four double plays and his average of 111.5 at bats per grounded into double play was fifth best in the AL…his four GIDP tied for third fewest in Oakland history among players with 500 or more plate appearances…they were the fewest since Tony Phillips grounded into two double plays in 441 at bats in 1986…reached base on an error seven times, which tied for eighth most in the AL…swung at the first pitch 37.4% of the time, which was sixth highest in the AL … started 88 games at first base, 20 in right field, five in left field and two at designated hitter … also made the first two appearances of his career in center field and at third base…committed seven errors at first base for a .990 fielding percentage, which was the lowest mark among AL qualifiers at first base (min. 108 games)…went 1-for-16 (.063) with a double, three walks and six strikeouts as a pinch hitter…the batting average is the lowest by an A's pinch hitter with 15 or more plate appearances since Jim Holt went 0 for 17 in 1974…made a team-leading 48 starts batting fifth … also batted cleanup 42 times and started in every spot in the order except first, second and ninth. OAKLAND: Matched what was then a career high with five RBI April 10 at Los Angeles (AL) after driving in four runs against the Angels the night before…went 0-for-5 with four strikeouts April 12 against Detroit, the first four-strikeout game of his career…also fanned four times April 29 against Los Angeles (AL) and May 12 at Seattle…was on the paternity list from April 16 to 18 for the birth of his second son, Brody (April 16)…hit safely in each of his first seven road games through April 20 (13-for-25, .520), giving him a 15-game road hitting streak dating back to Sept. 20, 2012…hit .463 (25-for-54) during the streak … connected for the game-ending home run in the bottom of the 19th inning April 29 against Los Angeles (AL), his third career walk-off home run…also homered in the sixth inning for his second career multi-homer game…had 12 innings between home runs to become the 17th player in Major League history to go at least 12 innings between home runs in one game…is the second Athletic to do it…Reggie Jackson also went 12 innings between home runs June 11, 1969…had four strikeouts to become the second Major Leaguer since 1916 to have at least two home runs and four strikeouts in one game … Evan Longoria did it Aug. 4, 2009 for Tampa Bay against Boston…hit .295 with 14 walks in 24 games in April for a .398 on-base percentage…added 19 RBI, which was the best single month total of his career … then batted .153 with a .262 on-base percentage in 27 games in May…had made each of his first 26 starts at first base before making eight consecutive starts as a right fielder from May 8-17 after Josh Reddick went on the DL…made his first career appearance in center field May 9 at Cleveland (also May 13 vs. Texas) … matched his career-high with four strikeouts May 12 at Seattle…made 51 of his 52 starts from May 13 to Aug. 9 in games started by a right-handed pitcher…hit the 7000th home run in Oakland history May 13 against Texas off Justin Grimm in the third inning…also connected for the 12,000th home run in Athletics franchise history June 5 at Milwaukee, a three-run homer off Michael Gonzalez in the seventh inning…had a 54-game errorless streak as a first baseman from May 18 to July 24, which is tied for 10th longest in Oakland history by a first baseman…went 3-for-36 (.083) over an 18-game stretch from May 21 to June 11 … played third base for the second time as a professional May 24 at Houston in the ninth inning…the other time was in 2002 with the Red Sox affiliate in the Gulf Coast League … returned to third base in the 16th inning of the A's 18-inning game against NewYork (AL) June 13…had his second two homer game of the season June 12 against New York (AL) … the two homers gave him a streak where each of his last five hits were home runs…is the sixth player in Oakland history (10th time) to do that, the first since John Jaha (June 18-20, 1999) … the others are Jackson, McGwire (five times), Canseco and Giambi…hit seven home runs in the month of June, which matched the best single month total of his career at the time (hit eight in August)…was batting .228 with 97 strikeouts over his first 89 games through July 20…had a season-best seven-game hitting streak from July 26 to Aug. 3 (10-for-27, .370)…went 13-for-33 (.394) with seven home runs and 14 RBI over a 10-game stretch from Aug. 19-29…that began a season-ending stretch where he batted .314 with 12 home runs and 33 RBI in 34 games…tied for the Major League lead in home runs over that span and tied for second in RBI…hit his second walk-off home run of the season Aug. 19 against Seattle … it was the fourth of his career and his third as an Athletic, which is tied for fifth most in Oakland history … is the 10th player in Oakland history with two or more walk-off home runs in one season…now has six career game-ending hits (also a double and a single)…was named American League Player of the Week for the week of Aug. 26-Sept. 1 after going 8-for-22 (.364) with one double, four home runs, 11 RBI and eight runs scored in seven games…it was the second time he won the award (June 11-17, 2012)… started in right field Aug. 26 at Detroit after Reddick went on the DL for the second time and made 17 of his final 22 starts in outfield (12 in right field, five in left field) … homered in three consecutive games at Detroit Aug. 27-29…went 4-for-5 with two home runs and six RBI at Detroit Aug. 28…the RBI were a career-high and the hits and home runs matched his best…had 10 RBI in the four-game series at Detroit Aug. 26-29, the A's most RBI in a series since Damian Miller had 12 in a three-game series against Cincinnati, June 7-9, 2004…batted .288 with six doubles, eight home runs and 19 RBI in 25 games in August…the home runs were fifth most in the AL in the month and were the best single month total of his career…the RBI matched his most in a month (April, 2013) … then hit .302 with nine doubles, five home runs and 19 RBI in 22 games in September … tied for third in AL in September RBI and tied for fourth in extra base hits (14) … now has a .340 (50-for-147) average with 11 home runs and 37 RBI in 48 regular season games in September and October in two seasons with the A's … doubled in his final at bat of the game Sept. 11 at Minnesota to begin a season-ending streak where each of his final 11 hits were for extra bases (seven doubles, four home runs)…that is the longest single season streak in Oakland his tory and matches the longest overall streak … Eric Chavez had 11 consecutive hits for extra bases from Oct. 7, 2001 to April 14, 2002 (three doubles, one triple, seven home runs)…started all five games of the ALDS against Detroit (four at first base, one at designated hitter) and went 2-for-18 (.111) with 13 strikeouts … set a Division Series record for most strikeouts in a series, a mark he shares with Detroit's Austin Jackson, who also fanned 13 times in the same series. The non-roster invitee joined the A's in June and went on to bat .291 with 21 home runs and 52 RBI in just 84 games...the home runs tied for third most in American League history by a player with fewer than 90 games played...is one of just three players in Athletics history to hit 20 home runs in fewer than 100 games, joining Jose Canseco (22 in 97 games, 1992) and Woodie Held (20 in 92 games, 1957)...the home runs were a career-high as he had just 15 home runs in 249 games entering the season...also had career-highs in RBI and strikeouts (90)...added 18 doubles as more than half of his hits were for extra bases (39 of 77, 50.6%)...slugged a career-high .596, which was fourth best in the majors among players with 250 or more plate appearances...also had a career-best .358 on-base percentage...batted .290 (60-for-207) with 19 of his 21 home runs and 44 of his 52 RBI against right-handed pitchers compared to .293 (17-for-58) against left-handers...had a .643 slugging percentage against righties compared to .431 against lefties...has hit 32 of his 36 career home runs off right-handers...made just 11 of his 68 starts against left-handers...was 5-for-10 (.500) with a home run, four RBI and four walks as a pinch hitter...tied for third among AL pinch hitters in hits and walks...based on a minimum of 10 plate appearances, he had the best batting average and on-base percentage (.600) in the AL among pinch-hitters and ranked second in slugging (.800)...hit .254 with the bases empty compared to .331 with runners on base...hit an AL leading .545 (18-for-33) when putting the first pitch in play...hit 15 of his 21 home runs at night...10 came in 26 games before the All-Star Break...hit 11 in 58 games after the break...15 came as a first baseman, which were the most by an A's first baseman since Jason Giambi had 32 in 2001...hit six home runs in interleague play, which tied for fifth in the majors and matched the Oakland interleague record set by Miguel Tejada in 2000...started 51 games at first base, which tied for the team lead...also started 10 games in right field, five in left field and two at designated hitter...committed eight errors in 55 games overall as a first baseman, which was third most among AL first basemen...his .9818 fielding percentage was second lowest in Oakland history by an A's first baseman with 50 or more games...Jeff Newman had a mark of .9816 in 1980. Spent the entire season at Triple-A Lehigh Valley, batting .275 with 23 home runs and 80 RBI in 124games...ranked fourth in the International League in extra base hits (55), fifth in home runs, sixth in RBIand seventh in walks (62)...the home runs were minor league career-high as were his 62 walks...had a.368 on-base percentage...led the Iron Pigs in hits (120), doubles (31), home runs, RBI, walks, sluggingpercentage (.509), multiple-hit games (33) and strikeouts (127)...was selected by Philadelphia Sept. 17and went 0-for-6 with two strikeouts in five games...was 0-for-4 as a pinch hitter...appeared in one gameon defense Sept. 20 in the first game of a doubleheader against Washington...pinch ran, remained in thegame in right field and went 0-for-2. LEHIGH VALLEY: Hit .278 (88-for-317) with 19 of his 23 home runs against right-handed pitching...batted .259 (32-for-119) against left-handers...had a .326 batting average at home, compared to .222 on theroad...his average improved to .288 with runners in scoring position...however, he hit .200 with RISP andtwo outs...clubbed 14 of his 23 home runs in the sixth inning or later...appeared in 73 games in left field,two in center field and 43 in right field...ranked third among IL outfielders in assists (15)...also hit .364in nine games at designated hitter and was 2-for-3 (.667) with two RBI as a pinch hitter...hit in every spotin the order except first and fifth...saw most of his playing time hitting clean-up where he appeared in 87games...was the Opening Day starter at designated hitter April 7 against Scranton/Wilkes-Barre and went3-for-4...the three hits were a season-high...batted .364 over his first 11 games but then went 4-for-37(.108) over his next 13 contests from April 20 to May 2...set a Lehigh Valley record with a professionalhighseven RBI May 5 at Columbus...had a grand slam in the fifth inning and a three-run home run in theninth inning for his first of two two-homer games...had back-to-back two-double games June 13 and 14against Louisville...hit .295 in the month of June, his best single month average...added six home runsand then hit seven round-trippers in July...had his second two-homer game of the season July 15 againstSyracuse...had five straight two-hit games Aug. 13 to 18 (10-for-20, .500)...on Sept. 9 against Pawtucket,he tied the game with a home run in the second inning, had a go-ahead RBI double in the third and thegame-winning RBI single in the 10th...hit .385 (10-for-26) with four home runs, eight RBI and four runsscored in seven postseason games...had the game-winning RBI in two of the IronPigs' four wins. Spent first full season in the Majors withPittsburgh...Made 79 appearances (76 starts) in right field and 21appearances (19 starts) in left field...Had nine assists and made twoerrors; one fielding while playing left field on 7/25 at Arizona and onethrowing while playing right field on 8/6 vs. Arizona...Went 9-for-34(.265) with a home run and five RBI as a pinch hitter - hit club's lonehome run as a pinch hitter (his first career) in 2009 on 8/26 vs.Philadelphia...Was Pittsburgh's Opening Day starter in right field...Tiedcareer high with three hits on 4/8 at St. Louis...Hit safely in six straightgames from 4/11-19...Tripled on 4/17 vs. Arizona...Picked up first RBIwhile making first start in left field on 4/24 at San Diego in team game#16...Had two assists from right field on 5/3 vs. Cincinnati...Tripled againon 5/4 vs. Milwaukee...Went hitless in 15 straight at bats from 5/5-10...Snapped hitless streak with a three-hit performance on 5/12 vs. St.Louis, which included his first home run of the season...Produced sevenmulti-hit games in seven straight starts from 5/12-22...Hit .515 (17-for-33) in 10 games from 5/12-22, raising average from .174 to .269...Snapped an 0-for-15 streak with a two-hit game on 6/18 at Minnesota, hisfirst start since 6/12...Went 12-for-29 (.414) in final 10 games during the month of June, raising season average from .243 on 6/14 to .268...Hitsecond home run on 7/3 at Florida...Homered twice in a three-game span from 7/10-19 after hitting two home runs in his first 71 games of theseason...Hit walkoff home run leading off 9th inning on 7/22 vs. Milwaukee, connecting off lefty Mitch Stetter for his only long ball off a southpawin 2009 (second career)...Had total of 10 hits in 20 games (54 at bats) during the month of July - four of them being home runs...Went 3-for-8in first two games of August, but then went 3-for-31 in next 14 games...Snapped an 0-for-11 streak with pinch-hit single on 8/25 vs. Philadelphia;hit also snapped his 0-for-13 streak as a pinch hitter...Homered as a pinch hitter the following day off Ryan Madson - his first career home runas a pinch hitter...Went 2-for-4 with a pair of doubles on 8/30 at Milwaukee...Hit final home run on 9/2 at Cincinnati (the exact date and locationof his final home run in 2008)...Tripled and had two RBI on 9/4 vs. St. Louis...Hit safely in five straight games from 8/31 thru 9/7 (6-for-18,.333)...Batted fourth for lone time on 9/9 vs. Chicago and went 0-for-4...Singled as a pinch hitter on 9/12 at Houston...Tallied fourth triple andknocked in two runs on 9/18 vs. San Diego...Had lone sac fly on 9/23 vs. Cincinnati...Swiped lone base on 9/30 at Chicago (game two) - hissecond career stolen base and first since 7/8/08 while playing with Boston...Hit .323 (20-for-62) with three home runs and 10 RBI in 18 gameswhile batting seventh in the lineup. Was a member of Boston's Opening Day roster...His first Major League home run was a game-tying, solohome run in the 9th inning off Oakland's Huston Street on Opening Day (3/25) in Tokyo, Japan; he finished the game 2-for-5 withtwo RBI and became the first player in Red Sox history to homer in a regular season gameoutside the United States or Canada...Was optioned to Triple-A Pawtucket on 3/26...Made atotal of 36 appearances at first base, five in right field and three as the designated hitter forthe PawSox...Hit seven of his eight home runs off righthanders...Knocked in five runs whilegoing 3-for-6 with a pair of doubles and a home run on 4/18 at Indianapolis...Was recalledby Boston on 4/26...Hit second home run with Red Sox off Edwin Jackson while also recordingan outfield assist on 5/2 vs. Tampa Bay...Was placed on the 15-day disabled list on 5/5 (retroto 5/3) following an appendectomy...Began a rehab assignment with Pawtucket on 5/22...Wasrecalled from his rehab assignment, reinstated from the disabled list and optioned to Triple-A on 5/23...Collected an RBI in eight of his nine games from 5/23-31...Homered three times and had four RBI on 5/31 atDurham...Was named the International League Player-of-the-Week for the week of 6/2...Was recalled by Boston on 6/6 and hit .222(8-for-36) in the month of June...Was optioned back to Pawtucket on 7/24...Hit a pair of home runs and tallied three RBI on 7/27at Toledo...Was acquired by Pittsburgh as part of a three-team trade on 7/31...Made first start with Pirates in right field on 8/1 atWrigley Field and went 0-for-3 with a walk and an assist (doubled up Derrek Lee at first base)...Hit first home run with Bucs on 8/3at Chicago (NL) - a solo shot off Carlos Zambrano...Hit safely in four of his first five games with Pirates...Made game-ending catchand doubled up Shane Victorino in 12th inning of 2-0 win at Philly on 8/8...Snapped an 0-for-13 streak with a single in final at batat Philly on 8/9...Snapped 0-for-11 streak with a 2-for-4 effort on 8/13 vs. Cincinnati - also hit his first home run at PNC Park on8/13...Suffered left ankle sprain while turning to run out of the batter's box on 8/17 vs. New York (NL)...Missed two games andreturned to action on 8/20 at St. Louis and went 2-for-4 with a double...Hit first career home run off a left-handed pitcher when heconnected off Chicago's Ted Lilly at PNC Park on 8/25...Had three straight multi-hit games from 8/24-26...Went 3-for-4 with a homerun on 9/2 at Cincinnati, but had three hits in his next 34 at bats...Tripled and tallied career-high three RBI on 9/5 at SanFrancisco...Delivered walk-off double in 7-6, 12-inning victory vs. St. Louis on 9/13...Had a pair of outfield assists on 9/17 vs. LosAngeles (NL)...Tripled again on 9/20 vs. Houston...Appeared in final game on 9/21...Missed last six games due to cartilage beingseparated from the bones in his left knee...Had a diagnostic arthroscope performed on the knee by Dr. Steadman in Vail, Coloradoon 10/3...Hit .246 with 14 doubles, eight homers and 34 RBI in 79 games with Boston and Pittsburgh. Was Triple-A Pawtucket's team MVP and a mid-season International League All-Star,but also made his major league debut over 2 stints with Boston...Led the International Leaguewith 41 doubles and 59 extra-base hits and also ranked among league leaders in total bases (6th,232), RBI (7th, 78), OPS (8th, .834), hits (9th, 139) and walks (T10th, 61)...Led the PawSox with 16home runs and tied for the team lead with 66 runs, while batting .282 in 133 games...Made hismajor league debut from August 6-8 and closed the regular season in Boston following his September1 call-up...Went 6-for-18 (.333) in 12 games (4 starts) in his 2nd stint with Boston. Spent the entire season with the Double-A Eastern League champion Portland SeaDogs, earning EL Playoff Most Valuable Player honors after hitting .361 with 5 home runs and 10RBI in the postseason...in the regular season, led the league with 36 doubles, ranked 2nd with 83RBI, tied for 5th with 76 runs scored and tied for 9th with a .285 batting average...also belted 12homers in 133 games...after the playoff run, joined the Aguilas Cibaenas of the Dominican WinterLeague, batting .327 (18-for-55) with 3 homers and 10 RBI in 14 games. JUNE PLAYER OF THE MONTH: Was named Red Sox Minor League Offensive Player of the Monthfor June after batting .352 with 5 homers, 22 RBI and 24 runs in 24 games...was named EasternLeague Player of the Week for June 19-25 after batting .478 (11-for-23) with 4 doubles, a triple, ahomer and 7 runs scored in 6 games...finished the month with an 11-game hitting streak. FINISHING FAST: After a slow start that saw him hit .221 (42-for-190) in 48 games through theend of May, batted .324 (103-for-318) in 85 games over the remainder of the season. Earned Eastern League All-Star honors in his Double-A debut, batting .268 with 31 doubles, 16 homers and 61 RBI in 135 games for Portland...ranked 2nd in the league with 87 runs scored. CALLING ALL STARS: After hitting .209 (14-for-67) in 17 games in April, batted .308 (62-for-201) over 54 contests in May and June en route to being selected by fans to start in right field for the Northern Division All-Stars at the E.L. All-Star Game...went 1-for-2 with an RBI in the game, which was held on his home diamond of Hadlock Field. PRIME TIME IN THE POSTSEASON: Played in all 9 Portland playoff games, going 7-for-19 (.368) with 3 doubles, a homer and 2 RBI in 5 games of the Northern Division Championship Series vs. Trenton...hit a solo homer in the deciding Game 5 to snap a 2-2 tie in the bottom of the 3rd, giving the Sea Dogs the lead for good in a 9-2 win...was 3-for-16 (.188) with a homer and an RBI in 4 games of the Eastern League Championship Series vs. Akron. MAY HONORS: Earned the organization's Quality Plate Appearances Award and Defensive Player of the Month Award for May...hit .304 (24-for-79) with 5 doubles, 4 homers, 14 RBI, 13 runs scored and 12 walks in 23 games. MORE 2005 HIGHLIGHTS: Put together a season-best 13-game hitting streak May 29-June 9, batting .420 (21-for-50) with 6 doubles, 4 homers, 11 RBI and 14 runs to lift his average to .287 from .219...in a 6-game, 4-day road series at Harrisburg June 13-16, went 12-for-27 (.444) with 3 doubles, 3 homers, 7 RBI and 11 runs...coupled with a 2-for-5 effort at Bowie the day before the series, had 6 multi-hit games in 7 contests to raise his average to .300 from .277...batted just .168 (17-for-101) in 27 games in July, and went on to hit .313 (42-for-134) in 37 games the rest of the way...batted .500 (16-for-32) with 4 doubles, 2 home runs, 5 RBI and 8 runs over his final 8 regular-season contests...played for the Peoria Saguaros of the Arizona Fall League following the season. Honored as Red Sox Minor League Player of the Year after batting .353 (182-for-516) with 27 doubles, 7 triples, 15 homers, 111 RBI and 21 stolen bases in 132 games for Single-A Augusta and Sarasota...was named South Atlantic League Most Valuable Player with Augusta...led the league in batting at .339 and in RBI with 101 in 109 games...earned mid-season and year-end Sally League All-Star honors, and garnered the MVP award at the Mid-Summer Classic...was promoted to Sarasota August 10 and hit safely in his first 14 games, batting .542 26-for-48)...went on to hit .422 (35-for-83) with 10 RBI and 16 runs in 23 games with the SaraSox, hitting safely in 20 of the 23 games...was the Florida State League Player of the Week for the week of August 16-22, batting .516 (16-for-31) with a homer, 3 RBI and 7 runs in 9 games...was the Red Sox Minor League Player of the Month in both May and July, batting .363 (41-for-113) with 26 RBI in 28 May contests and .344 (42-for-122) with 27 RBI in 30 July affairs...also earned the South Atlantic League Topps Player of the Month Award for July...reached base via hit or walk in 29 straight games April 18-May 20, starting with a 16-game hitting streak, during which he hit .451 (32-for-71) to raise his average to .382 from .226...had another 16-game hitting streak June 25-July 14...posted 51 multi-hit games at Augusta and 12 at Sarasota. Hit .237 with 34 RBI in 65 games with short-season Single-A Lowell...smacked his first pro home run July 2 vs. Oneonta...collected just 4 RBI without a homer in his first 11 games, and then went on to knock in 13 runs and connect for 4 homers over his next 7 contests, including a 5-RBI effort vs. Batavia July 6...hit 3 homers and collected 17 RBI in 49 games the rest of the way. Was selected by Boston in the 8th round of the First-Year Player Draft and assigned to the rookie-level Gulf Coast League Red Sox...hit just .152 (10-for-66) in his first 24 games...batted .277 (13-for-47) over his next 18 games to close out the year. 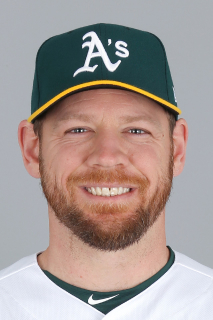 March 6, 2018 Oakland Athletics released DH Brandon Moss. March 4, 2018 Oakland Athletics designated DH Brandon Moss for assignment. February 1, 2017 Kansas City Royals signed free agent DH Brandon Moss. November 3, 2016 1B Brandon Moss elected free agency. August 2, 2016 St. Louis Cardinals activated 1B Brandon Moss from the 15-day disabled list. July 28, 2016 St. Louis Cardinals sent 1B Brandon Moss on a rehab assignment to Springfield Cardinals. July 5, 2016 St. Louis Cardinals placed 1B Brandon Moss on the 15-day disabled list. Left ankle sprain. July 30, 2015 Cleveland Indians traded 1B Brandon Moss to St. Louis Cardinals for LHP Rob Kaminsky. December 8, 2014 Oakland Athletics traded RF Brandon Moss to Cleveland Indians for 2B Joey Wendle. April 18, 2013 Oakland Athletics activated 1B Brandon Moss from the paternity list. April 16, 2013 Oakland Athletics placed 1B Brandon Moss on the paternity list. June 6, 2012 Oakland Athletics selected the contract of 1B Brandon Moss from Sacramento River Cats. March 30, 2012 Brandon Moss assigned to Sacramento River Cats. December 27, 2011 OF Brandon Moss assigned to Aguilas Cibaenas. November 19, 2011 Oakland Athletics signed free agent RF Brandon Moss to a minor league contract and invited him to spring training. October 17, 2011 Philadelphia Phillies sent Brandon Moss outright to Lehigh Valley IronPigs. October 10, 2011 Brandon Moss roster status changed by Philadelphia Phillies. September 30, 2011 Philadelphia Phillies reassigned RF Brandon Moss to the minor leagues. September 17, 2011 Philadelphia Phillies selected the contract of RF Brandon Moss from Lehigh Valley IronPigs. April 2, 2011 Brandon Moss assigned to Lehigh Valley IronPigs. November 19, 2010 Philadelphia Phillies signed free agent RF Brandon Moss to a minor league contract and invited him to spring training. November 3, 2010 Pittsburgh Pirates sent Brandon Moss outright to Indianapolis Indians. September 7, 2010 Pittsburgh Pirates selected the contract of Brandon Moss from Indianapolis Indians. April 5, 2010 Pittsburgh Pirates sent Brandon Moss outright to Indianapolis Indians. March 29, 2010 Pittsburgh Pirates designated RF Brandon Moss for assignment.